Heel pain can be an extremely annoying problem it can prevent patients from their day to day activities. It is a problem that you DON’T have to suffer there are modern treatments available that are extremely fast and effective relief without resorting to drugs such as steroids. We can offer most patients quick relief from their symptoms. Heel pain can be caused by several things so it is important to firstly have the correct diagnosis made before commencing any sort of heel pain treatment. One of the most important things is to seek treatment early, many patients will leave it far too long before seeking treatment and fast outcomes will only occur if the treatment takes place early. Some of the more common causes of heel pain are enthesopathy this is an inflammatory reaction where the plantar fascia inserts into the calcaneus (the heel bone) there is too much traction (or pulling) at this insertion point and it sets up an inflammatory process. Patients will often complain of pain that is worst in the morning but the pain will settle slightly as the day goes on. Heel pain treatment for this condition if commenced early can resolve the pain in as little as a week, however if not treated for a long period the pain may become more intense and a patient may develop a heel spur. This is basically a bony projection at the point where the plantar fascia meets the heel bone, heel pain treatment for this condition although still successful in reducing the pain can take much longer. Some other conditions that can cause heel pain include a bruised heel this typically is caused by a hard blow to the heel . Heel pain treatment for this includes rest and icing will initially help. Other conditions that may cause heel pain include micro tears in the posterior part of the plantar fascia the body tries to heal these but it can take some time for this to occur. We can however speed up this process making the time you suffer this pain much less. At Brighton Podiatry we are the most technologically advanced Podiatry clinic in Melbourne to help with heel pain treatment. We have the latest equipment to help speed up heel pain treatment, in fact with most patients we can offer considerable relief to heel pain in just one visit. If you are battling problems with heel pain you do not need to suffer we can help you. Give us a call and schedule an appointment today advise the receptionist that you need heel pain treatment, we are sure that we can offer you almost immediate pain relief so you can get on with your busy life without having to suffer this debilitating pain in your heel. 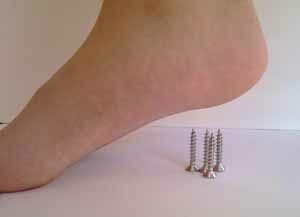 Some other things that are available for heel pain treatment include the injecting of cortisone to the area this has short term benefits but does not do anything to help the problem long term, it is extremely painful and depending on the skill of the practitioner the results may range from a few days of relief to around a month. The problem with this form of heel pain treatment is when the cortisone wears off you are often in more pain than when you started. Long term use of cortisone has some risks and we suggest if you go down this path do not have more than one or two shots of cortisone. Plantar warts can sometimes develop nerve endings within the lesion this results in a very painful plantar wart. Patients find it extremely difficult to carry on their normal day to day activities without almost constant pain. This type of wart makes plantar wart treatment very difficult. Plantar warts get in to the bottom of the foot through typically some sort of micro trauma. Walking barefoot on the pavement is enough to develop the micro trauma that will enable the Human Papilloma Virus to inoculate the foot with a plantar wart. Some patients will get this micro trauma from the non-slip surface around swimming pools and this is also a good place to be inoculated with the plantar wart virus. As other people with warts already on their feet will slough small bits of tissue infected with the wart virus the combination of micro trauma and infected tissue leads to the development of Plantar Warts. Research on different forms of plantar wart treatment will yield many suggested forms of treatment. Some of these methods include duct tape, acids, freezing with liquid nitrogen, banana skin and the list just goes on and on. As a professional who specialises in plantar wart treatment we look for a treatment method that has the following qualities. It is repeatable and reliable, that is that it will work successfully on a very high percentage of patients that it is used on. It must cause minimal pain to the patient whilst the plantar wart treatment process is in progress. Firstly I must stress that these lesions are very stubborn and they are difficult to resolve. Plantar wart treatment should commence as early as possible otherwise the plantar warts may spread and grow in size making any form of treatment more difficult. He is a 35 year old male he presented with one plantar wart on the Left foot behind the great toe the wart has had plantar wart treatment before as follows. He went to a Podiatrist and had the wart burnt with a solution of Salicylic Acid for several months there was no noticeable result and in fact the plantar wart became more painful. He then decided to seek a second opinion and went to a second Podiatrist he was treated further with more acid treatment and again there was no result. He then decided to visit a General Practitioner who initially froze the plantar wart with liquid nitrogen after several months when there was still no result he decided to apply more acid to the area suggesting it was “almost gone” but a month later it was still there and causing pain. The General Practitioner then referred him to a Dermatologist. The Dermatologist suggested the use of duo film gel and wrapping the foot in Gladwrap and taking Vitamin D and Zantac orally after several months there was no result. The Patient then made an appointment to see Dr Greg Bastin at Brighton Podiatry. Dr Bastin specialises in the treatment of plantar warts. Dr Bastin has pioneered the use of laser for plantar wart treatment. He has lectured in China on the use of this plantar wart treatment. This patient was very sceptical after spending a considerable amount of both time and money to find a plantar wart treatment that worked. Dr Bastin explained the procedure and the patient decided to go ahead with the treatment. We initially asked the patient to return in 1 week as the wart was badly damaged with the continual use of acid this time allowed the Wart to dry out. We then treated this patient with one session of laser and apart from around 3 days of minor discomfort the patient felt almost nothing. After 9 short weeks the Plantar Wart resolved there was no further pain from this lesion, the patient was extremely happy. He wishes he had visited us before wasting his time and money on other forms of treatment. If you are suffering from Plantar Warts visit the experts in plantar wart treatment first and save yourself a lot of heartache. WASHINGTON (AP) — The government issued a health warning Wednesday about potential problems associated with two drugs widely used to treat fungal infections of the nails and skin. The Food and Drug Administration is requiring that labels for the prescription drugs Sporanox and Lamisil carry stronger warnings about potential liver damage, and labels for Sporanox also cite potential heart damage. New labeling for Sporanox will state that it should not be used in patients with heart disease. The new labeling for both drugs strengthens current warnings of serious liver problems, including liver failure and death, associated with Sporanox products and Lamisil tablets. The warnings do not apply to the cream or solution versions of Lamisil. The FDA said studies of Sporanox found that the drug has the potential to weaken the force of the heart muscle contractions, an effect that stopped when the drug was no longer used. After learning of that problem, the agency reviewed reports of problems in people who used the drug between its introduction in 1992 and last month. Ten of those who died had other serious health problems. Doctors will be told that because of the possibility of serious liver problems they should get a laboratory analysis to confirm the diagnosis of a fungal infection before prescribing the either drug. The agency said it has reviewed 16 possible Lamisil-associated cases of liver failure including 11 deaths and 24 cases of liver failure possibly associated with Sporanox, also including 11 deaths. Physicians are being sent letters advising them of the new warnings by the manufacturers of the drugs. Sporanox is made by Janssen Pharmaceutica Incorporated, of Titusville, New Jersey. Lamisil is a product of Novartis Pharmaceuticals of East Hanover, New Jersey.